Previous post: How Would You Feel if Your Spouse/Partner Broke Your Budget? Thinking about having your kids start music lessons? I studied piano and violin for a total of some 13 years (formal lessons). Reflecting on my experience, here are some ideas for saving money on your kid’s (or your) music lessons. 1. Look for used music books. You want to make sure that they’re not too marked up, because you and your teacher may want to write your own notes in there–due dates, difficult passages, and the like. But used music books are a real boon. If you’re lucky, someone might also lend you theirs–say if they want to keep them for younger children’s lessons but don’t need them right now. 2. Pass music books from kid to kid. Since my sister and I each took 2 years of piano with the same woman (though something like 1 year apart? 2? ), she was able to reuse all my books. Very handy. After that, we started studying different instruments and needed different books. 3. Look for student teachers. My worst (first) violin teacher was a true professional. She was reasonably well known, experienced, in a symphony, and completely wrong for me. I always felt worthless in my lessons and was completely unmotivated to practice. 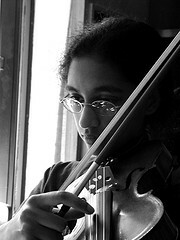 My next violin teacher was a sophomore in college. She was studying entomology, not music, but she was a great teacher. She was always very encouraging and got me excited about music. Where I hadn’t finished a single book in my 2 years with the first teacher, I finished 3 or 4 with her. After she graduated and left, I had another lovely student, then two more expensive and excellent teachers along with a decent chap, but Rebekah will always be my favorite. Nothing about a teacher’s experience says that they’ll be right for your kid. So if you can find a less expensive college student they work well with, go for it! 4. Buy their instrument, don’t rent. Consider very seriously buying the child their own instrument, depending on pricing and growth. I’ll give an example. Once I reached a “full” size violin, my parents bought me my own for something around $500 (less?). Here’s the thing–that was cheaper than renting. Renting was $50/month coming to $600 for one year. “Baby” then lasted me for another 4 years or so until I decided to buy my own. Who knows, depending on rental prices it might not have been a bad idea to buy me one when I was at a half or 3/4 size. That would have depended on how well they thought they could resell it and what they were renting the other for. While renting may be the best option with homeowning, renting an instrument is like leasing a car. You only want to do it when you absolutely have to. If you don’t have the money up front, some stores will give you financing. (I can’t believe I’m recommending financing.) Even with interest, it may be cheaper than renting…especially if your child is using a full size and plans to play the instrument for at least two more years. 5. But be careful when you buy frugally for your kid’s instrument. I came to one of my lessons with the second student-teacher (who was also my friend, we’d had some highschool language classes together) to find her really annoyed. Apparently the previous lesson hadn’t gone very well. The mom had come in very excited because she’d found new strings for her daughter’s violin. At the flea market. I’m sure people at the flea market do sell strings that they bought and just didn’t need. But these were pieces of wire–not calibrated the way strings need to be. It just…it didn’t work. And she had been having a hard time convincing the mom that this wasn’t actually a bargain at all. Instruments themselves at flea markets might be just fine. But consider asking your child’s teacher to come along if you don’t know much about them. Or ask the seller to hold it for you until the teacher can check it out. 6. And always consider school instruments. Maybe you’re homeschooled or your school doesn’t offer instruments. I was the former, so this wasn’t an issue. But a lot of people learn to play on school instruments. Disadvantages are that you may not be able to keep them for the summer (probably won’t), won’t be able to keep them if the child changes schools, and you may not be able to get one if they don’t have enough. But on the plus side they might also be free. Definitely a good alternative to renting one or buying one when your child is using a smaller instrument and/or not positive they’ll stick with it. I have a lot of great memories of my violin. And I still have my violin, so I can make many more. If you want the same for your kid–I hope you’ll find a way to do it within your budget. I can’t speak as a parent, since I don’t have kids, but I studied piano and oboe throughout my pre-college years. I think one important thing that many doting parents need to keep in mind is that, in all likelihood, your child is not going to be a professional pianist, violinist, etc., and they may quit sooner than you’d like. Thus, don’t feel compelled to go out and buy professional quality instruments. You can buy a used instrument if you know enough about the instrument to avoid lemons. But there are also very serviceable “student quality” instruments available at music stores. Moreover, as long as these instruments are of decent quality, they can be resold to partially recoup costs. And specifically to parents interested in the oboe (which I suspect may be close to no one, but I assure you this is a wonderful instrument, once your kid stops quacking like a duck on the reed): If your child shows true interest in this instrument after a year or two of study, seriously sconsider investing in a reed-making kit. A reputable teacher can show your kid how to make his or her own reeds, which over time will save you hundreds of dollars in reeds. Kits cost around $100 and are totally worthwhile since reeds cost $10 a pop and wear out in 2-4 weeks. One more tip: If you live near a large university, especially one that offers a music program or a teaching program, investigate whether there are free or inexpensive classes available. The teaching college at my university offered free lessons in many different instruments as well as voice to people in the neighborhood. The option of a school instrument is interesting but not always as good as it seems. Many schools (including the ones I attended), have a deal with a local store (similar to the one where you got “Baby”) and the students have to sign a rental contract. Other schools may have budgets to stock instruments for instruction. Always check out what the school is offering and make sure you understand any cost to the student or family. When I played French Horn, I played on a school instrument. I could sign it out any night I wanted, and also keep it over the summer. The only thing we had to sign was a pledge to cover most of the replacement cost if, while in our care, the instrument got run over by a bus or otherwise lost or destroyed. My brother used to run and hide from our piano teacher, Lala, a Ukrainian immigrant, but I enjoyed the lessons (of course). All of our lesson books were in Ukrainian, very similar to Russian. Music ed? That’s fascinating Flexo…I wouldn’t have guessed. One nice thing about owning my own instrument means that I’ve decided (after writing this post and reading responses) I’m going to spend some time playing tomorrow–maybe Meditation to start off and then some concerti. And “Albert” is actually my car of a violin. Purchased when I was 16 with my savings and some gift money…pretty decent for someone who doesn’t really play. I’ve got two kids taking lessons and I already use a couple of these tips. The others are GREAT too. I’m buying the instruments in installments through a local small business music shop where they take lessons with a student teacher (two birds with one stone). The reason I’m doing it through installments is in case the kids decide they don’t like to play. For the older one, this isn’t an issue probably, so we also have the opportunity of ‘trading-up’ to a better instrument. The little one still hasn’t ‘quite’ got the hang of the violin, so I’m holding off buying it until he shows he’s going to hang in with it. If you think a violin is expensive, check out the prices of saxes! I started out on “student” saxes and am now having a hard time selling them for enough. Sure, they were cheaper than buying nicer instruments, but I ended up buying pro horns after all because there is a big difference in quality, sound, and even just the feel. I fear that too many students give up on music because it’s harder to play great on bad instruments (not impossible, but definitely harder). If you can’t afford a pro-level instrument, or fear that your kid won’t stick with it, do get a student horn, but get a used one that works well and maybe doesn’t look too pretty because the price of brand new student horns is ridiculous. That way, you can save money to buy a better horn later. And for wind instruments, invest plenty in a great mouthpiece. It’ll improve the sound immensely and help make up for a sub par horn.